Ghirardelli Square is a beloved San Francisco landmark and a highlight when visiting Fisherman's Wharf, the city's waterfront tourist hub. Today, the former chocolate factory (three stories and a full city block in size) is filled with dozens of unique shops and eateries, including an outpost of the iconic chocolate maker that gave the square its name, as well as home to the Fairmont Heritage Place, a luxury all-suite boutique hotel for long-term and extended stays. It's almost impossible to visit SF's kitschy Wharf without exploring Ghirardelli Square, a historic bayside structure that had a big hand in making the neighborhood the focal point it is today. It was at Ghirardelli's San Francisco factory that a worker first discovered the Broma process, a popular chocolate making process that extracts cocoa butter from roasted cocoa beans through a drip method. Ghirardelli passed away in 1894, though the SF factory lived on until the 1960s when — after the purveyors of Rice-a-Roni, purchased the company — it moved its headquarters to San Leandro. At that point San Francisco shipping exec William M. Roth and his mother bought the land beneath the square and converted its historic brick structures into a restaurant and retail complex, making it the country's first major and successful adaptive re-use project. In 1982, the D. Ghirardelli Company and Pioneer Woolen Mill — California's first wool mill, which manufactured uniforms for Union soldiers during the Civil War — were listed together on the National Register of Historic Places, joining a bevy of other notable nearby listings that include Alcatraz, the Alma scow schooner at SF Maritime National Historical Park, and Fort Mason Historic District. Today, the square's renovated Clock Tower is home to its Ghirardelli Chocolate Shop, where you can still sample the delicacies that made it famous. In fact, Ghirardelli Chocolate Company has been in continuous operation since Ghirardelli first incorporated it in 1852. Ghirardelli chocolate is synonymous with San Francisco, and there's no better place to get your sweet-tooth fix than the Fisherman's Wharf chocolate marketplace, housed in the Clock Tower of its namesake Ghirardelli Square. Free chocolate samplings are par for the course at this popular spot, which includes a dessert cafe and an area where you can learn about the chocolate making process and watch chocolate being made on historic equipment, like a scene straight out of the film, "Willy Wonka and the Chocolate Factory." Along with an assortment of Ghirardelli fudge-topped ice cream sundaes and soda fountain offerings, like chocolate malts and milkshakes, the oh-so-sweet smelling shop stocks decadent treats such as brownies, cookies, and chocolate-dipped strawberries, along with selection of chocolate souvenirs, including a choose-your-own chocolates gift package. While here, take full advantage of the opportunity to snap a pic outdoors beneath the square's iconic arched lighting Ghirardelli sign. Ghirardelli Square is home to nearly two dozens shops, bars, and restaurants in addition to its chocolate shop, including Elizabeth W, stocking an assortment of handcrafted bath, body, and home goods such as sea foam eye pillows, lilac hand cream, and bottled bath salts; the uniquely Bay Area offerings of Jackson & Polk, where you'll find artisan jewelry pieced together from vintage finds and whimsical greeting cards and illustrations by SF-based artist Tomoko Maruyama; and 3 Fish Studios' colorful California prints. Renowned seafood and steaks restaurant McCormick & Kuleto's offers waterfront views and fine dining from its three-level Ghirardelli Square post, while the SF Brewing Co. and Beer Garden is a great place for sampling craft brews and comfort pub fare ranging from mahi mahi tacos to pizza topped with goat cheese and veggies. There's even an outdoor beer garden ideal for taking in scenic views before Karl the Fog makes his all-too-often appearance — in which case there are multiple fire pits to keep things warm. Other popular venues include The Cheese School of San Francisco, which relocated here from its Mission neighborhood location in 2018, and Culinary Artistas, a hub of cooking classes and culinary day-camps for teens and kids. The square is also a great jumping off point for exploring the Wharf's bustling waterfront, where you'll find other landmark establishments like Boudin at the Wharf, home to SF's famed Boudin sourdough bread; Pier 39 and its resident sea lions; and the ferry to Alcatraz Island, aka “the Rock,” which houses one of the most notorious former federal penitentiaries of all time. 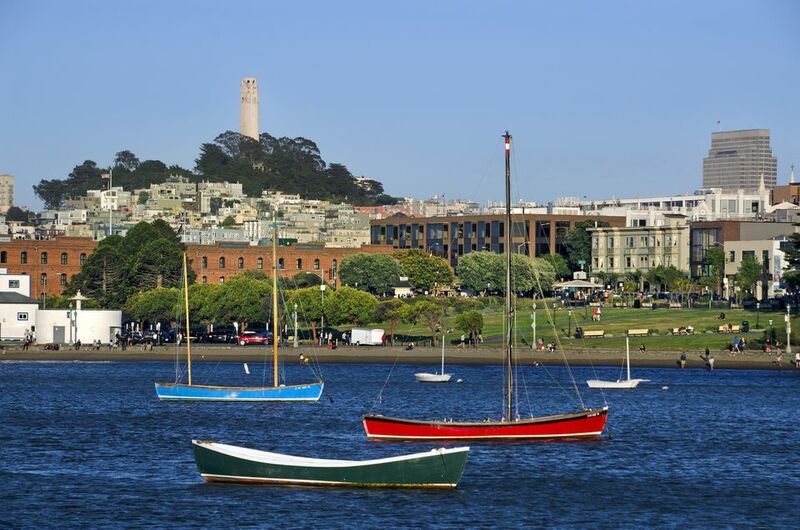 Just a short walk from the square are quirky tourist hot-spots such as the Ripley's Believe it or Not Museum, Madame Tussauds Wax Museum, and the SF Dungeon, an entertaining and fully engaging walk through San Francisco's vivid history, from its Gold Rush Greed to the Chinatown Plague. For a truly quintessential SF experience, swing by the Buena Vista Cafe — just one block east of Ghirardelli Square — and order an Irish coffee. You won't be the only one. Street parking is particularly hard to come by in the Wharf, but Ghirardelli Square does boast its own garage which is open from 6 a.m. to 2 a.m., daily, and costs $5 for the first hour and $8 for each additional hour, with local residents getting a substantial three hours for $5 parking deal. The Square is also easily accessible by way of San Francisco's MUNI F-Market and Wharves historic streetcar lines — which run back and forth from the Wharf to the Embarcadero's Ferry Building Marketplace, and often further. You can ride aboard restored vintage street cars from cities around the world, including Melbourne, Milan and Osaka. The city's Powell/Hyde Cable Car line, which runs atop Russian Hill overlooking twisty Lombard Street and then continues on through Chinatown and into Union Square, has its turn around right in front of Buena Vista. There are wheelchair accessible restrooms at the square, along with additional restrooms in many of the shops and restaurants.